Steph chats with me about her Juniper Song mysteries — Raymond Chandler/LA noir, as told from the point of view of a young Korean-American woman who starts out sticking her nose where it doesn’t belong in the first book, Follow Her Home, and over the rest of the series slowly becomes a full-fledged PI. 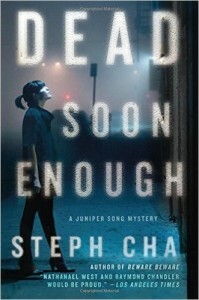 I recommend reading the books in order, as the consequences of Song’s first case reverberate throughout the series. The most recent book, Dead Soon Enough, tackles surrogate motherhood as well as the continuing fallout from the Armenian genocide. A stunning novel.